Looking for some input into some black powder loads for the 45. I have tried Black MZ(32.5 grns)...got too much "crack" and recoil than I want! I also tried Triple 7(FFFG) and it was worse for the "crack" and recoil at 25.5 grns. I'm looking for the "thump" or "deeper" sound with the black powder. Fillers...any ideas/suggestions on using fillers in the casing or just fill it to where I get a slight compression when seating the 200 grn bullet? FFg regardless of powder, I prefer Goex or Graf's. Fill the case to the base of bullet 1/16"-1/8" compression. If it's still too much recoil use some filler. I find 25gr of Goex FFg topped with lizard litter to be comfortable with plenty of BOOM; in a 44WCF which will be similar to 45 Colt. 777 is the hottest of the subs and if you were using FFFg that's part of the reason for the "crack". You want BOOM ,,,,, use real B/P. Case closed. 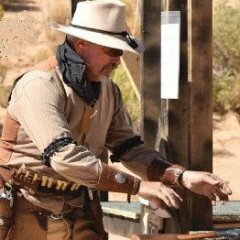 I use grits as a filler with around 28grns of 2f, I save 3f for 38 long colt or percussion pistols. 45 colt and Schofield get 2f make sure with real black you use lube bullets. shotgun gets any leftovers or the cheapest powder you can find. One of my favorite loads for 45 Colt is; Starline brass and fed standard pistol primer. I use a 24grain spout on a powder flask to dispense GOEX FF in the case. Then a .7cc scoop of cornmeal on top of the powder. Finish with a 250g Biglube bullet full of SPG. Shoots very well in a 66, 73, 92 and several revolvers. Goex Old 'E' 2F, fill the case till you compress the powder about 1/8-3/16" when you seat the bullet. That pretty much covers it. I won't waste my time or money on fake black powder. Like Tyrel mentioned, 25 grains of FFg or FFFg and enough lizard litter to compress a little is pretty comfortable in a 44-40 or 45 Colt. I used 1cc of FFF APP with the Captain Baylor's backer rod trick for some time. Before that I used 1cc of grits with 1cc of fff APP. I tried holy black with different fillers over the years, but never could get enough lube to keep the barrel from fouling and losing accuracy badly with the tumble lube Lee bullets I cast. If I need a filler with Black Powder, I use fine-grain activated charcoal. That is of course exactly one component of black powder itself, so it will neither be "more abrasive", nor prone to compress into a solid cake that raises pressures (as most cereals can do). It adds NO more power to the black powder load, because there is no "extra oxygen" in the BP than just amount needed to burn the black powder's charcoal and sulfur. Besides, that activated charcoal "crunches" just like BP does - so you can hear that you have gotten a little compression when you seat the slug. And no one thinks you are cooking breakfast. If I may offer another idea, instead of messing with fillers and such, why not try a smaller case/cartridge? .45 Schofield or .45 Cowboy Special ("Cowboy .45 Special"? "Special .45 Cowboy"? whatever) both hold less powder than .45 Colt reducing the recoil while you can still get the "boom". Either will work fine in a .45 Colt caliber revolver. The Schofield may, and the .45 CS probably won't cycle in a rifle without modification. Now that Starline has taken up stocking and distribution of C45S, the cases are easy to get and affordable. Reloading requires some set up and considerations. The case makes wonderful smokeless loads and even better black powder or sub loads. No fillers required. Yes! A full case load of BlackMZ is too powerful! I load 1cc in my C45S loads and still get tons of smoke and plenty of kick. I would have a couple of suggestions. First would be to drop your powder charge to 20 - 25Gr, made up the rest with Cream-0-Wheat, change to a 160 - 180Gr bullet. Next would be to reduce your cartridge case size, either to 45 Schofield or Cowboy 45 Special. Also, 2f will give slightly less felt recoil. 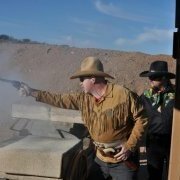 Cowboy 45 Special will be problematic in Rifles. 45 Schofield will run in a Toggle Link rifle with a 200Gr RNFP. NOTHING shorter. Triple 7 makes a marvelous garden fertilizer. Black MZ and APP are very nice BP Substitutes. C45S cases can be used in Toggle rifles with a custom carrier. +1 I've gone to loading C45S cases in the pistols, which negates the need for any filler. In a '66 I've gone to using .45 S&W Schofield cases. The only times I use a .45 Colt case now is the rare times I drag out the '92. I'll probably end up selling that off and a bunch of .45 cases, whenever I find a round tuit. Ah, well, annealing your cases will eliminate that pesky Blow-By. or just fill it to where I get a slight compression when seating the 200 grn bullet? not 45, but for my 44WCF I load 35gr of Goex FFg. 250 grain Big Lube PRS bullet, and 2.2CC of FFg. Works out to around 33 grains. I like Schuetzen the best. It is the same stuff as Graffs, just a different label on the bottle. A guy was at the loading table and it looked like his ammo was loaded with wadcutters. I made mention and he said no, bullets loaded backwards. Said it reduced case volume (I'm sure that it would) and that the bullet going out the muzzle backwards reduced recoil (I'm doubtful of that) because of the boattail effect. Looked like he crimped in lowest lube groove. I've shot with him a lot and never seen him load that way before or after. I wouldn't call him an expert at reloading. Yes to C45S in .45 LC pistols, smokeless and black powder. You have the option to use bullets intended for .45 ACP which helps with buying options and price. I like SWC bullets. No crimp groove, set your bullet depth, and taper crimp..light roll crimp will work too. I used to shoot with a guy years ago who used to load his bullets backwards. It's been a long time, but I believe he was shooting 44 Special. But he was shooting Smokeless. I believe the reason he loaded them backwards was to take up some of the volume in the case. Of course, I hope he had done his homework because the pressure would be different with the reduced case volume. I haven't seem him in a long time, but I don't remember him mentioning anything about reduced recoil. I didn't mention it but his loads were smokeless also. With black powder, all you'd need to do is follow the same rules of slight compression. With smokeless, you're on your own. Maybe get buy with wadcutter loading data?